I want to ask a respected community for some advice. I have long taken up the project of printing a model of a "Kraga" radio-controlled aircraft. The case was progressing normally until it stalled in the production of wings. This should be fine work and I basically do not like print quality. 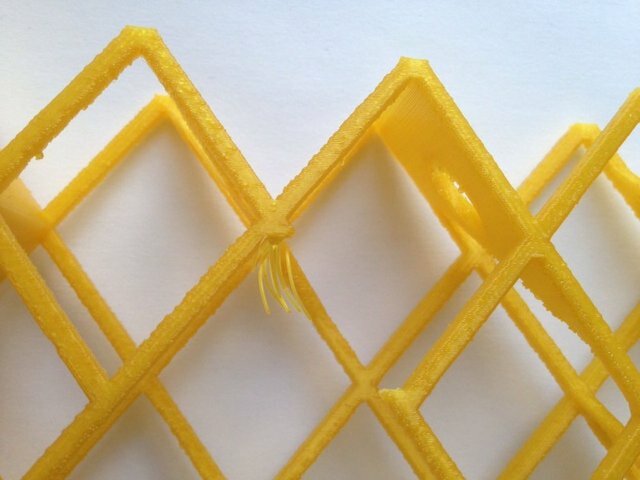 I type on Ultimaker 2+, golden Pla / Pha filament from Colorfabb, 0% infill, no bottom and top. I combined various speed and temperature settings. The result is negative. The default Cura settings for Pla do not work either. 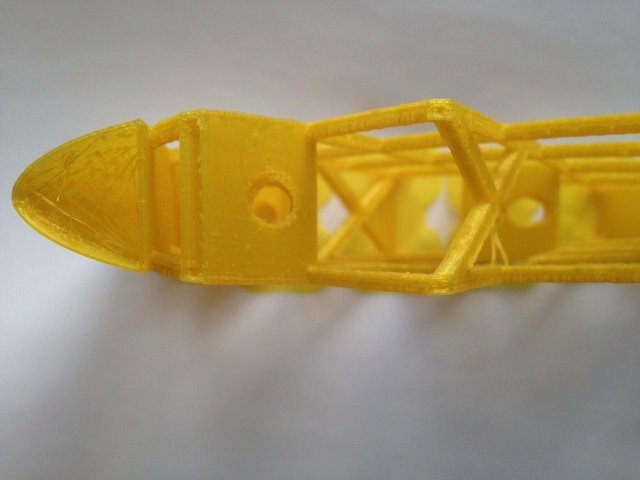 Question 1: What settings (other than basic) can I try to print this part? Can someone also print this model? Question 2: During the retract, the priter stops long enough. Because of this, a flat dot is formed at the stop. This is very dirty print. How to avoid it? Question 3: Which one would you recommend for the best filament Pla, Ultimaker, Innofil, Colorfabb? When used for a model plane, I'm not sure that it's the most optimal direction you are printing. all your cross bares will be very fragile. I would consider printing it laying down and using some supports. Sorry didn't see that it was a paid print project! Dit it come with print instructions? I still think the print direction will make it weak. But they have probably tested and ment it was strong enough. 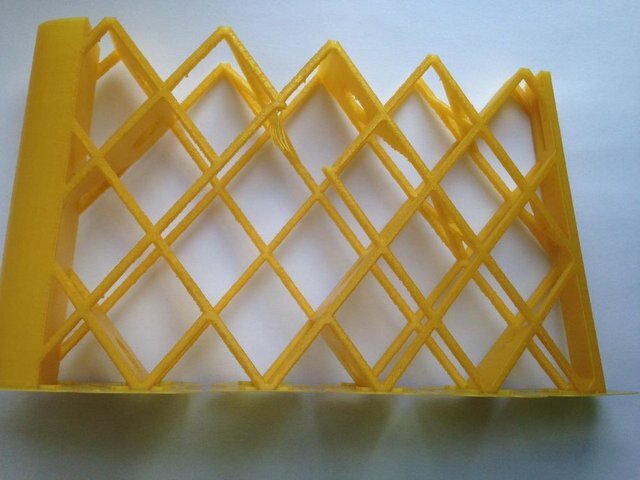 Colorfabb has a new lightweight PLA, maybe this is something for your project. I also think this is not the right direction for printing these models. Like in wooden matches: the grain of the wood should go in the same length direction as the match. Otherwise the match will snap if you try to light it. So this wing is likely going to be very brittle. It should be designed so that you can print all beams flat on the glass, and assemble these parts afterwards. So that it can absorb the forces and flex, like real wings. Meanwhile, for best strength, print rather hot and slow, but with fast travel speeds (so the nozzle doesn't leak while traveling through the air). I don't know if switching off retraction would help, or make it worse? It would surely cause more strings and be ugly, but I don't know about strength? Maybe you could cut out a small part of this design, and do a few testprints with various settings? Also, PLA may not be the best material: it is going to break upon the first crash landing. And it is likely to warp in the car, in a hot summer, while on-road to the meeting or airport. But I have no experience with 3D-printed planes myself, so it's hard to give good recommendations. The guys who developed this project with the aircraft in the instructions for printing are advised to print it in a vertical position and without support, although I agree with you that it would be much safer to place the layers along the structure. One of my friends said that of all existing PLA filaments Ultimaker's PLA is the best. I do not know how it is. Dear friends, thank you for your advice. I'll say you can't put it as a yes and no question. it varies from types within brands and colours. e.g. I like Ultimaker Tough PLA Black but can't get the Tough PLA White to work. same brand same type, only difference is the colour. "calcium like" which makes it more fragile. So depends on the project. In you case i will probably go fore Ultimaker Tough PLA for that extra strength. but again that delimits your colour choices. Yes, color is important, but properties are more important. I am very surprised at the fact that Tough PLA Black and Tough PLA White may differ in their characteristics. May I ask, have you ever tried printing Tough PLA Red? No sorry. But I'm guessing that it will work fine. I have never had any problems with red filament in general.